as a special event of the 12th international architecture exhibition in venice, the LUMA foundation presents an architectural project for a new cultural model, designed by frank gehry and his firm gehry partners, LLP. LUMA / parc des ateliers is a multi-purpose park located in the center of arles, france. this privately funded project combines refurbished industrial heritage buildings and new constructions. the site will be linked to the city not only through its programming, but also by a garden designed by belgian landscape architect bas smets. the project is envisioned as an archipelago of connected project spaces and worksites for the production of art and exhibitions, with the further aim of encouraging and facilitating collaborative research as well as informal encounters and exchange. offering prime conditions for artists and scholars to research and experiment, produce and exhibit work, this development will include new forms of collecting and archiving. it will also provide an infrastructure for activities from festivals to educational programs and artist residences. the LUMA / parc des ateliers will function as an incubator for the arts and as a field station for international art institutions. three models of different scales and illustration panels present the project. the event was introduced by maja hoffmann, president of the LUMA foundation, in the presence of architect frank gehry who won the golden lion for lifetime achievement at the 2008 architecture biennale. in my eyes gehry is more a sculptor than an architect. come on! is this a kind of copy of sesc pompeia by lina bo bardi? gehry should study a little more the projects of lina. he might learn something, but i think that would be difficult anyway. as Usual ,, shallow and way over rated ,, what I wonder what kind of patrons/ sponsors this guy has…..
Imagined, invented and designed as the ultimate cultural destination by artists, architects, art professionals and intellectuals, in accordance with local inhabitants who have an intimate knowledge of the town of Arles, it is an open campus for creative production, display, study and preservation. That was a difficult video to watch. I dig the climbing wall. oh my god! finally gehry took a step and did his second project 🙂 thank you mr.gehry for ending the torture for us! 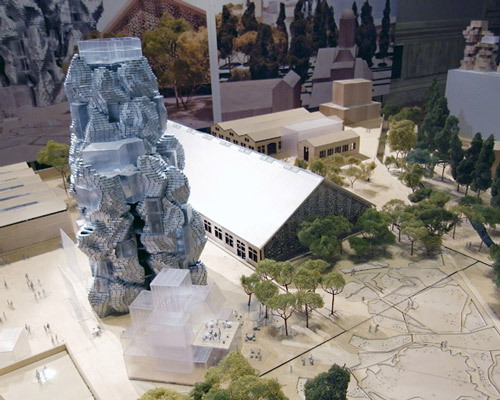 Why is Frank Gehry’s work so difficult to accept? He runs one of the most experimental architect studios today, who would not want to work there?